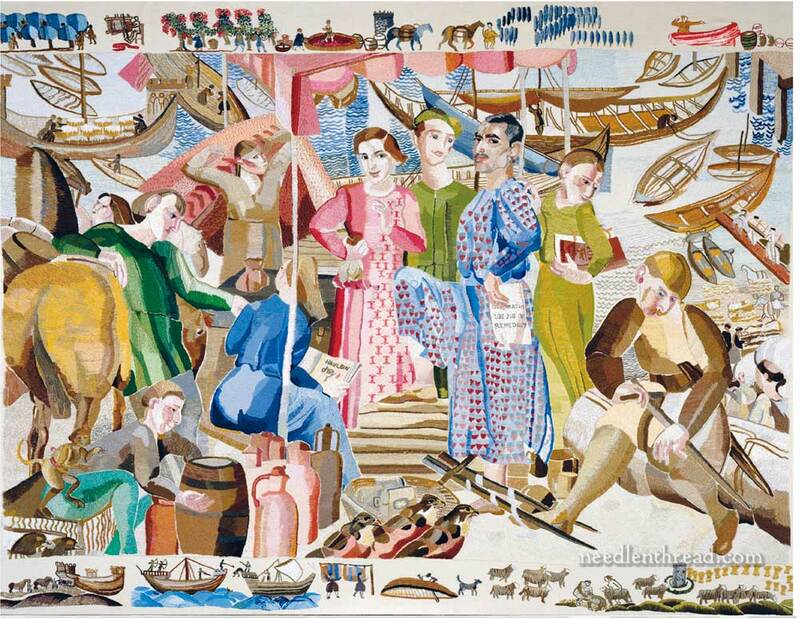 Conceived in 1998 by Dr. Paul Mooney of the parish of New Ross in County Wexford on the east coast of Ireland, the tapestry tells of the history of the Port of New Ross and its surrounding area, especially from the time of William Marshall and the Norman invasions. The photos below are courtesy of The Ros Tapestry initiative, and you can click on most of them to view larger images. 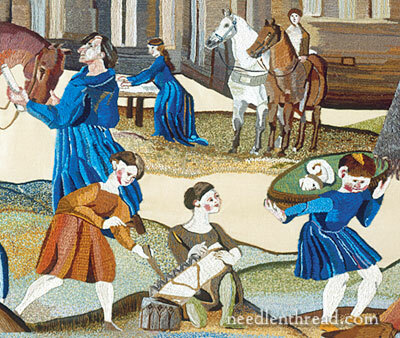 Made up of 15 separate panels that measure 72″ x 54″ and worked on linen with crewel wool, the Ros Tapestry betrays its original source of inspiration in the Bayeux Tapestry. Like its much earlier antecedent, the Ros Tapestry features scenes that are full of action and bordered by small details, scenes, and figures. 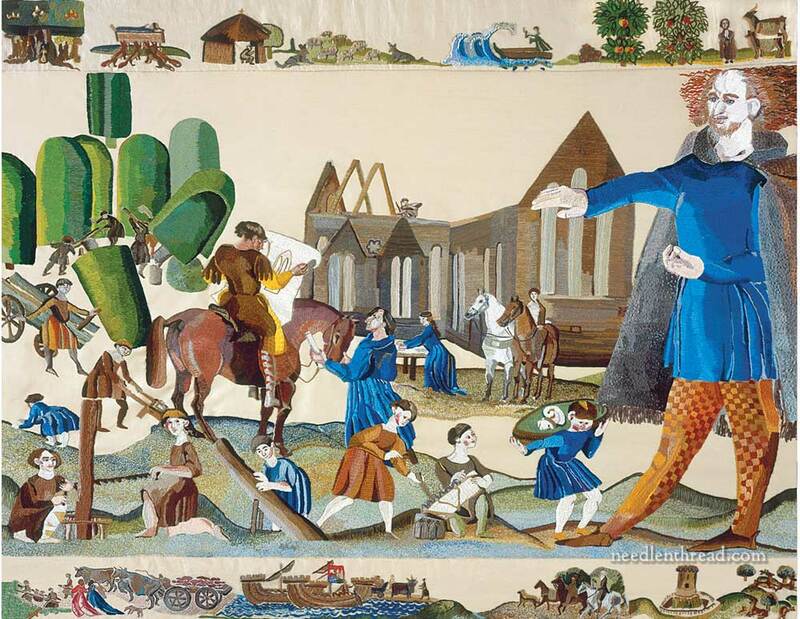 The “cartoons” (the paintings on which the tapestry are based) were designed by Limerick-born artist Countess Ann Griffin-Bernstorff. The embroideries – worked by more than 100 volunteers from surrounding areas – developed under the coordination, instruction, and guidance of Alexis Bernstorff, a textile conservator from County Kilkenny. 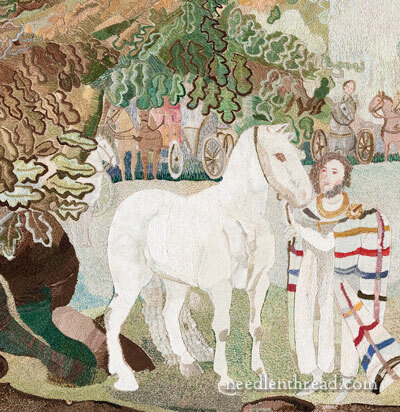 On the Ros Tapestry website, you can view the individual panels of the tapestry and see what part of the story they tell, along with photos of the many volunteer embroiderers industriously stitching away. The tapestries are crewel work, involving long and short stitch, stem stitch, bullion knots, seed stitching, and other stitches. The stitching relies on shading, padding, and variety in stitch type to create depth, texture, and a sense of movement. 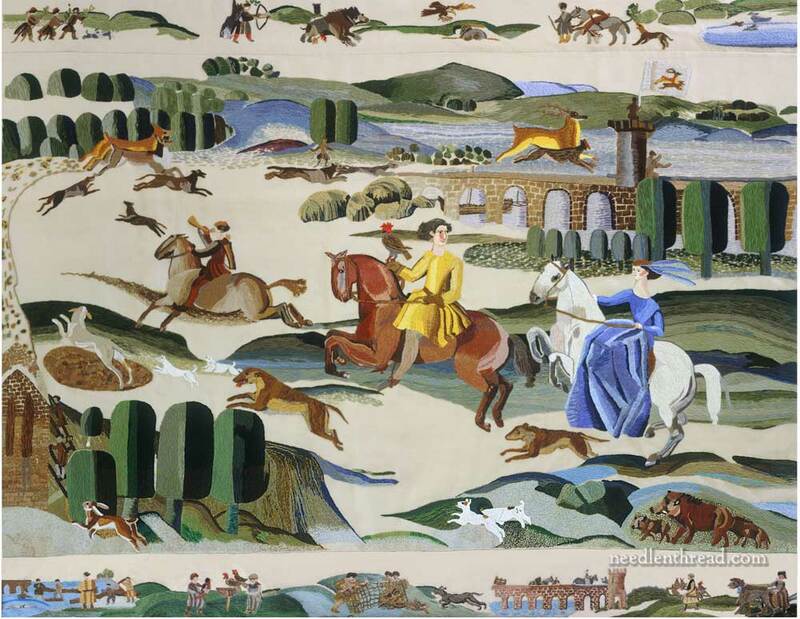 As is fitting, the style of the tapestry reflects the era in which it was made (the first decade of this century), and years from now, it will certainly be a testament to the art of today and, at the same time, to the art of the past. Though at first glance quite modern in design, there are certain aspects of the art that strike me as medieval. In medieval art, figures are representative rather than perfectly realistic. Rank and importance are shown by size in relation to surrounding figures, and by clothing and color. And in case we didn’t know William Marshall was the focus of the tapestries, here he is, larger than life compared to the figures around him! So while the embroideries tell the story of a distant age in a visual way that seems quite modern, the art itself is imbued with an historical sense, too. It is not wholly modern. Yet it is not medieval. And I find this very intriguing. And I can’t help it. I love the popsicle trees. 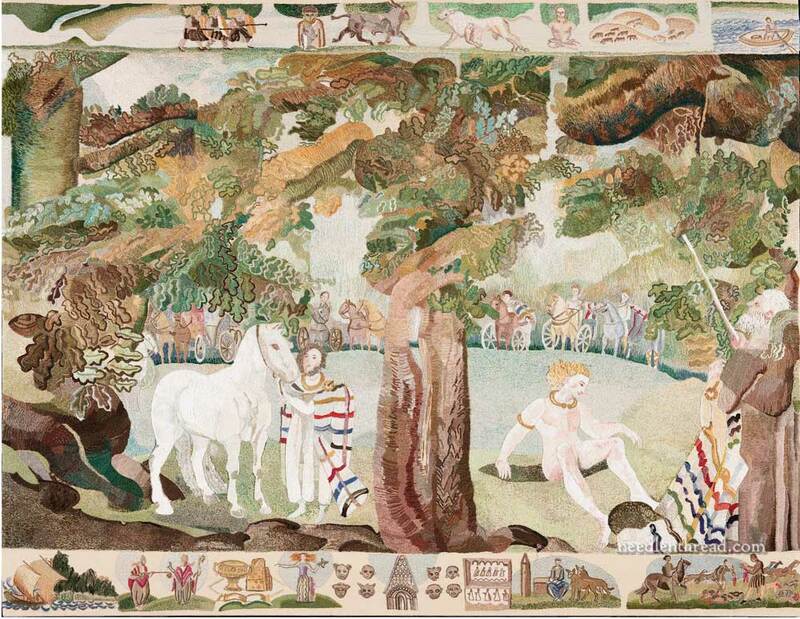 The shift in the style of foliage, from the more realistic trees and greenery in the first section of the tapestry (the first photo in the article, titled “The Celts, an Island Fastness”) to these definitely stylized trees, makes me curious. The first panel’s forests remind me of ancient forests, somewhat mythical and mysterious. These much more stylized trees seem to suggest an area that has been tamed or conquered. I love it when a piece of art makes me curious. I want to explore these panels and think about them. I want to see them in person! William Marshall was obviously a formidable character. In the section titled “Gothic Glory,” he oversees the building of the Gothic-style parish church of St. Mary’s in 1210. 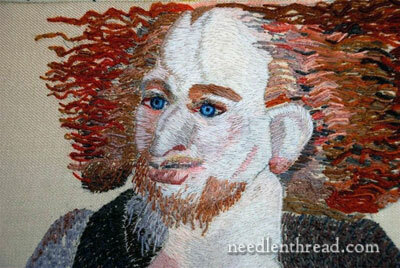 His hair includes lots of bullion knots! One of the most vivid sections of the Ros Tapestry is this one, depicting the thriving port city of Ros, Ireland’s foremost port in the 13th century, teeming with merchants and tradesmen, pirates and bankers. This prosperity lead to the walling of the city by the citizens, for protection (featured in the 14th section of the tapestry). You can visit the Ros Tapestry in its permanent exhibition center at Priory Court, The Quay, in New Ross, County Wexford, Ireland. Check out their visitor page on their website for more information on visiting hours. You can also support the efforts of housing and maintaining the tapestry by becoming a friend of the Ros Tapestry project. If Ireland’s in your future travel plans, add New Ross to your itinerary! I think the Ros Tapestry would be another fantastic embroidery exhibit that would be fabulous to see in person! 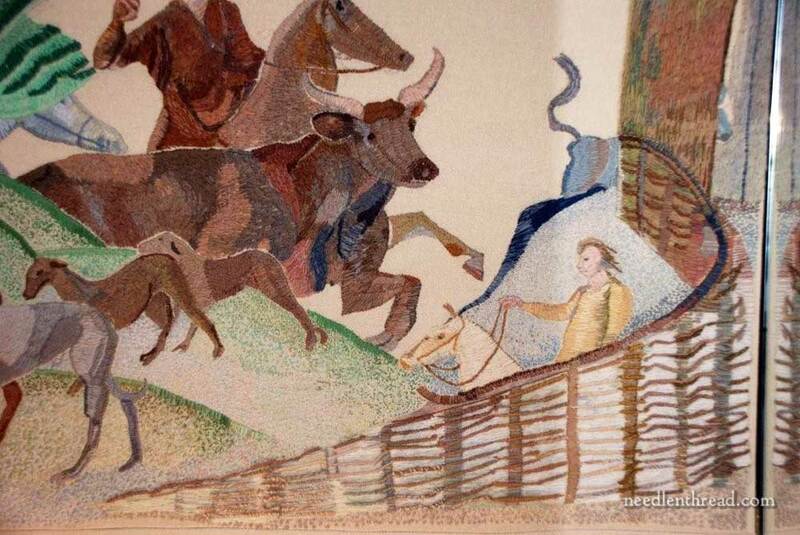 Many Thanks to Alexis Bernstorff for supplying photos and information on the Ros Tapestry! And a hearty congratulations to the valiant stitchers who saw its completion! Mary, thank you so much for this post. Why have I not heard of this project before? 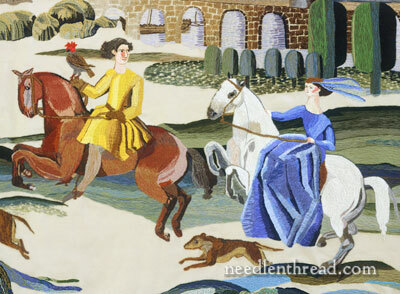 Being an enthusiast for history and embroidery the Ros Tapestry is just my cup of tea. I need to learn more! Thank you, Mary, for sharing this wonderful tapestry and providing close-ups of the amazing panels. At first glance, I thought they were medieval, but as I continued looking at the panels I was delighted to see the masterly combining of the modern touches. I can’t say which panel is my favorite. The port tapestry is amazing…I can almost hear the activity, and the monkey certainly shows a connection to distant shores. The hunt tapestry with the trained falcon…the harvesting of the ‘popsicle trees’…the daily activities draw me in. A wonderful, vivid story and an amazing undertaking! I’ve seen cuneiform tablets and papyrus to record history, but using a needle and thread to capture a moving moment in time is simply ingenious! 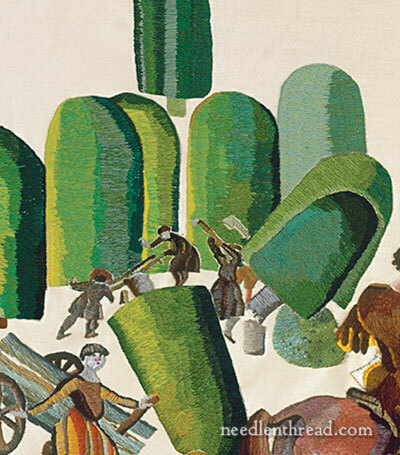 The toppling popsicle trees and William Marshall’s bullion knotted hair intrigue me. What an amazing display of tapastry work, I’ve just looked on their website and viewed the the history of the Ros tapastry project. What dedication, many of the stitchers had full time work and stitched the panels in their spare time. Thats dedication for you. Thanks for showing us the project. This reminds me of the Battle of Prestonpans tapestry (www.prestonpanstapestry.org) I saw at the 2011 Knitting and Stitching Show in Harrogate, England. These tapestries are truly amazing, and I don’t believe we do anything like them here, although some of the volunteers are from the US. Interesting. There was a similar tapestry made about the history of Rhodesia. I was recently given a book about it. Different sections were embroidered by different branches of the Women’s Institute in Rhodesia (now Zimbabwe).